(February 2019) Greg Power, Terminal Manager in Truro, accepted an award on behalf of the entire Midland team last week. 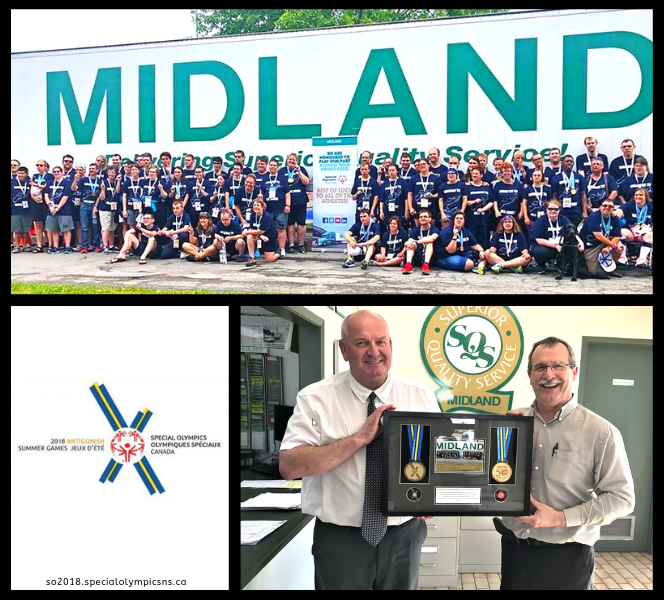 This award recognized the contributions from Midland in the Special Olympics 2018 Summer Games. Midland’s donation included trucks and drivers to transport equipment to and from the event, as well as refrigerated trailers to store water and other provisions during the entirety of the games. The competition was hosted at St. Francis Xavier University in Antigonish, Nova Scotia. This is the second time the province of Nova Scotia has had the honour of hosting the event, the first-time taking place in 1994. Next month, more than 100 of our outstanding Canadian athletes will be competing in the Special Olympic World Games in Abu Dhabi and Dubai. Best of luck to the athletes, coaches, and staff as they proudly represent the nation across 9 different sports!